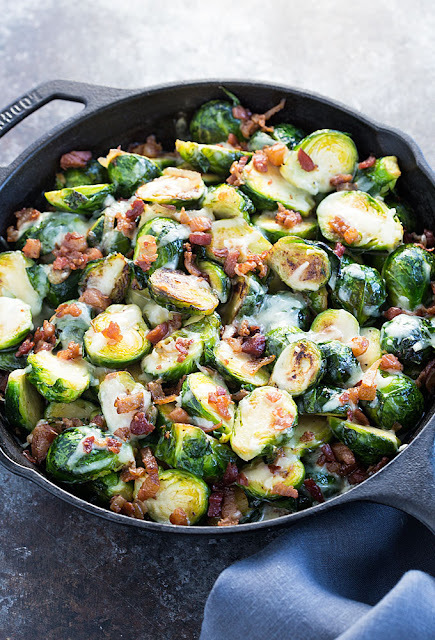 This recipe calls for cooking the brussels sprouts and shallots in a large oven-safe skillet, since you’ll transfer the skillet from the stove top to the oven. If you don’t have one, then cook in a large skillet on the stove top as directed, then transfer the mixture to a casserole dish that has been sprayed with cooking spray and add your additional ingredients. If you enjoy brussels sprouts as much as I do, this MUST be on your holiday table. Enjoy! Preheat your oven to 375 degrees F. Melt butter in a large oven-safe skillet over medium heat. Add brussels sprouts and shallots. Season with the salt, black pepper and cayenne pepper. Stir well to combine. Cook for approximately 10-12 minutes, or until tender, stirring frequently. Remove skillet from heat and evenly drizzle heavy cream over mixture. Top with shredded cheeses and bacon. Bake (uncovered) for 12-15 minutes, or until cheese is melted and bubbly.